In a matter of days, officials from countries around the world will have an historic opportunity to protect a record number of sharks and rays – including oceanic whitetip sharks, hammerhead sharks and manta rays – from the unsustainable international trade that threatens their survival. International trade in wild plants and animals is worth billions of dollars a year and in too many cases, threatens species survival. In the case of sharks – sought after for fins, meat, oil, teeth and cartilage – regulation is sorely lacking for almost all trade and is a key driver in species decline. Manta and mobula rays span the tropics of the world and are among the most captivating and charismatic of marine species. However, their survival is severely threatened by growing fisheries pressure driven by demand for the gill rakers that the animals use to filter feed. 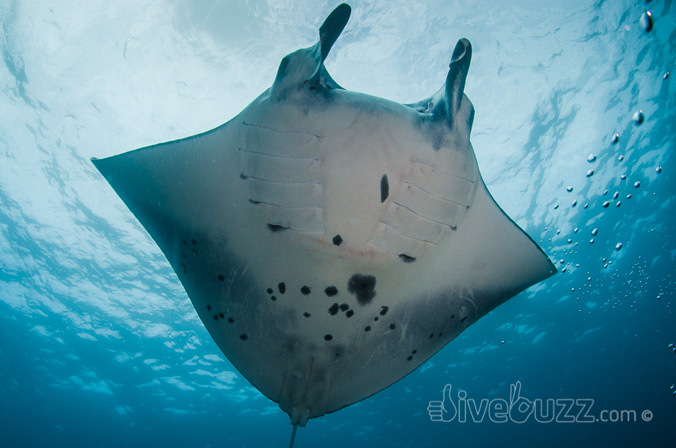 Both the giant manta and reef manta face an uncertain future. Global manta and mobula ray populations are currently unknown. What is known, however, is that these species are slow to mature (8-10 years+), are long-lived (40 years+), and reproduce very slowly. A manta ray will give birth to as few as a single pup every two to five years. These characteristics make manta and mobula rays extremely vulnerable to overfishing, regional depletion and local extirpation. Now globally threatened and exceptionally vulnerable, intensified fishing pressure in warm waters around the world is quickly pushing mantas to the brink. The gill rakers of manta rays are traded internationally, primarily to China and Singapore, for use in an increasingly popular Asian health tonic. This trade goes on unregulated and unmonitored. Yet the long term economic benefits from manta tourism greatly outweighs the short term returns from fishing. Globally, the annual value of manta-based tourism has been estimated at more than US $75 million. During the 16th meeting of Conference of the Parties to CITES (Convention on International Trade in Endangered Species of Wild Fauna and Flora), held in Bangkok, Thailand, from 3 – 14 March, delegates will consider 70 proposals affecting more than 300 species, including the world’s most vulnerable sharks and manta rays. Project AWARE Foundation is calling for a surge of support from scuba divers and shark advocates worldwide. 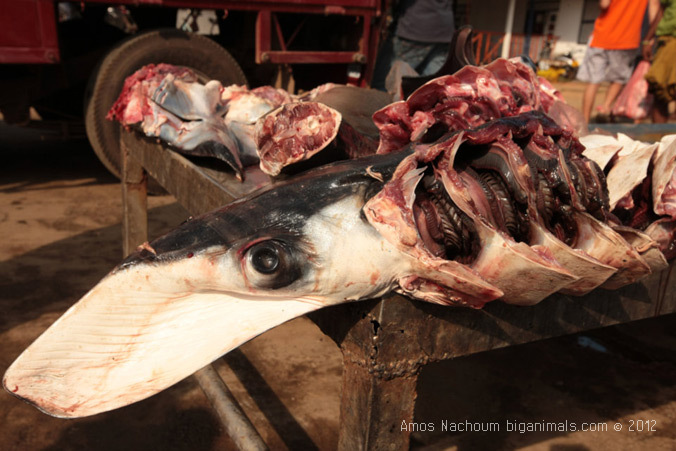 Sign the petition urging CITES member countries to give sharks and manta rays much needed protections. Send a letter direct to CITES authorities urging them to vote “Yes” for sharks and rays. Spread the word. Download the “Extinction is NOT an Option” sign, take a picture and post it to the Project Aware Facebook wall of support. Strong off the recent success to secure the European Commission’s vote to close loopholes in the EU shark finning ban and armed with petition signatures from more than 120,000 divers and shark advocates worldwide, Project AWARE and partners will push for the two-thirds majority vote necessary to secure a brighter future for vulnerable sharks and rays this March. Mantas Last Dance from Blue Sphere Media on Vimeo. The time of the manta rays is over, lost to greed and exploitation by humans. Hannah is a wanderer, a sea gypsy, a manta ray reincarnate as person, lost to the world. Alone and searching for a time long past, she gives herself up to the sea, slowly walking into the waves and drifting into the dark abyss. In a dream-state, she awakens falling through water, bubbles and lights. An manta glides gracefully from the darkness and approaches her, brushing close to her hand and face…and she smiles. Other mantas appear and she is united with her lost family at last. A dance begins with Hannah and the mantas emulating each others movements, a dance they have done a thousand times before. 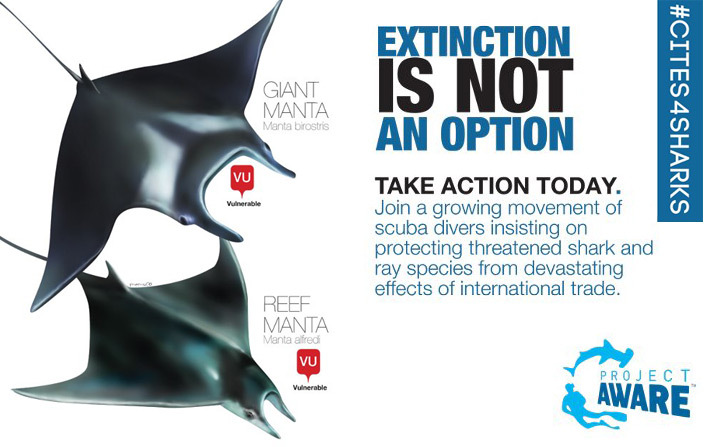 We must act now to protect manta rays or they will be lost forever!